Learnings from the Adobe Summit - It's all about the "Experience" | Constellation Research Inc.
Learnings from the Adobe Summit - It's all about the "Experience"
In my opinion, this is a stronger message and go-to-market strategy for Adobe as the Marketing solutions previously appeared detached from each other. Customers expressed some confusion on which solutions they needed to accomplish their objectives. The re-alignment of the solutions by cloud provides cohesion and better packaging of the offerings. Impactful Customer Stories on Digital Transformation - Adobe shines with big B2C brand customers sharing their digital transformation stories. Standouts included T-Mobile and the NBA. T-Mobile’s SVP of Digital, Nick Drake, gave an energetic keynote on the journey transforming their website with Adobe Experience Manager (AEM). Drake stated that by keeping the focus on customer experience on their website and reducing the amount of time/clicks needed to order products (previously up to 81 clicks), find assistance, etc. Their new website powered on AEM saw a 485% conversion improvement. One key takeaway from Nick’s keynote for Marketers to take note - instead of forcing their existing processes into the website design, T-Mobile put design and experience first then adapted their processes accordingly. Seems like a small step, but the number of companies I talk to that try to force-feed their existing process then end up with less than desirable results is more than you think. I also had some one-on-one time with Adobe customer Franke, a global kitchenware company with over $2b a year in revenue. Franke worked with their agency One-Inside, to build an immersive virtual experience to showcase their products using AEM. Franke CMO Renato Di Rubbo is helping the company transition from traditional marketing tactics such as catalogs and showrooms to now digital experiences to broaden their reach. He called Adobe, a “great technology partner” enabling their marketing transformation. Product Enhancements - Sensei and Integrations of Marketing + Creative Cloud - From a product perspective, I was pleased to see more cross-cloud integration between Adobe’s Creative and Marketing Clouds. Marketers can now launch Dreamweaver within Adobe Campaign to create and edit emails, landing pages, and other web assets. Adobe Experience Manager (AEM) DAM now integrates with Creative Cloud to auto-identify and sync content. Sensei, Adobe’s Artificial Intelligence (AI) solution launched at the MAX conference last year, had a prominent showing at Summit as well. With Sensei, images from AEM can be analyzed and tags automatically applied for improved asset organization and management. AI solutions have the potential to improve the marketer’s workload with intelligent segmentation, automating next best offers, help track marketing campaign attribution, and optimize marketing budget, which I believe is the direction Sensei is heading. However, most of the customers I talk to at the conference are still confused on what is available in Sensei today beyond the image processing capabilities demonstrated. There is an opportunity for Adobe to help customers better understand the technology by providing additional marketing use cases. Cross-Channel Marketing - In my Mobile Marketing Best Practices for CMOs report, I included the statistic that nearly 60% of US adult mobile device users own more than one device, of which 28 percent own three devices or more. In turn, the ability for marketers to deliver a cross-channel customer experience has increased in urgency. One of Adobe’s solutions to address the cross-channel marketing problem is their Cross-Device Co-op, an initiative launched in 2016, which pools the device data of customers that opt-in to the program. The Co-op allows member companies to leverage their collective non-personally identifiable data for improved digital advertising campaigns. The program has been steadily growing over the past year according to the Co-op product team, with about 30 customers currently participating in the free program. Deepening of the Microsoft partnership - AEM is now offered on the Microsoft Azure cloud hosting platform and integrations between Campaign and Microsoft Dynamics 365 CRM connects the marketing and customer lifecycle data. CMOs with an eye on marketing campaign ROI can benefit from the Adobe Analytics and Microsoft Power BI integration. I asked Adobe SVP Suresh Vittal if we might see a Sensei + Cortana AI partnership a la Einstein + Watson. Apparently, those discussions have begun. 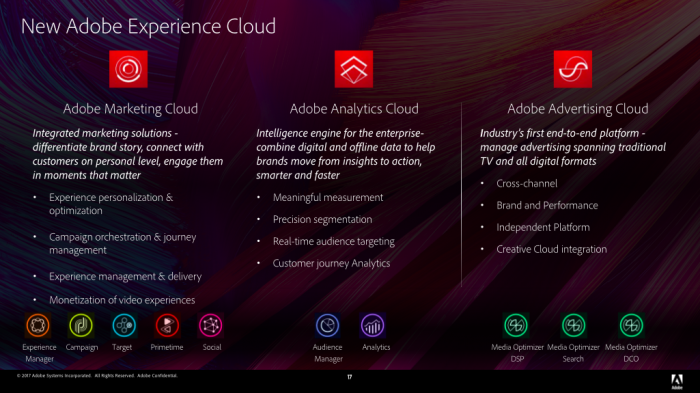 Final thoughts - The newly branded Adobe Experience Cloud provides improved cohesion on Adobe’s go-to-market strategy. Customers are accustomed to a suite based approach and the organization of the formerly individualized products makes it easier for customers to understand and buy by-the-cloud. AEM is one of the top Web Content Management platforms and the Microsoft Azure announcement will help customers speed up their go-live for faster time-to-value. I particularly enjoyed the “Sneaks” session with the company’s technical talent showcasing their ideas on future marketing features. The Virtual Reality ad replacement and AI journey demos were two standouts and offered a peek into what might be included in Adobe’s future product roadmap. Lastly, as a marketer that has attended several events at the Venetian over the years, Adobe takes the prize on creativity and incorporating the “fun” of marketing into the event. The visuals, customer keynotes, and educational sessions showcased Adobe’s influence with CMOs and marketers and made for an enjoyable conference.